Islamorada has the best fishing opportunities in the world and also some of the most iconic marinas to park your boat or just stop by for a visit. Checkout these listings including Backcountry Fishing, Offshore Fishing, Marinas, Bait and Tackle. Fishing charters and guides for the flats backcountry - tarpon, bonefish, snook, permit, redfish, shark and more. Father and son team, Captains Ted and Donnie Benbow are native to the Florida Keys. Always fish with a native guide. Florida Keys Fishing Adventures and Sniper Charters specialize in a variety of fishing charters including backcountry, flats, reef fishing, offshore fishing, night time tarpon trips , and family fun fishing as well as eco tours, bird watching, wild dolphin excursions, romantic sunset cruises, covering the Atlantic Ocean, Gulf of Mexico and Florida Everglades. Florida Keys Fishing Adventures & Sniper Charters is based out of Post Card Inn , Holiday Isle Marina in Islamorada, the fishing capital of the world and home of the World Famous Tiki Bar. A Pirate for Hire Charters offers fishing in the Fabulous Florida Keys, Backcountry, Flats, and the Everglades National Park for Tarpon, Snook, Trout, Redfish, Bonefish, Permit, Shark, Mackerel and many more. They also offer sunset tours, ecotours, night fishing, evening Tarpon and Shark Trips all with Captain Ron Brack, a third generation professional fisherman, licensed in 1982. Even before he was licensed he had already been fishing his entire life and had served as a deckhand on a professional basis for over six years. He has captained boats ranging in size from sixteen ft. to sixty five ft. He has fished in waters from North Carolina to the Bahamas and several areas in the Gulf of Mexico. However, South Florida`s gem, (Islamorada!) has always been home and holds his heart as well as his favorite fishing spots. Backcountry Fishing - Fly or Spin for Tarpon, Permit, Bonefish, Redfish , Snook, Trout and more. Docked at Worldwide Sportsman. Specializing in Offshore and Backcountry light tackle and fly fishing. 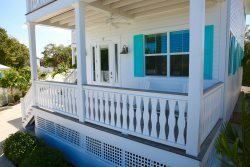 Call or email today and they will personally strive to give you a tailor made Florida Keys adventure docked at Angler House Marina, mile marker 80.5 bayside. Premier marina for backcountry anglers and destination for backcountry fishing trips. They do special events, corporate retreats, and fishing trips for corporate events. Kayak rentals and eco tours, kayak fishing, kayak sailing and publisher of Teall`s Guides. Fishing Charter on 32` ft. Regulator " Rigged & Ready" Backcountry and Offshore Fishing Charter! Docked at Robbie`s Marina. Enjoy a tailored fishing experience in the Florida Keys & the Everglades National Park. Depending on your preference will we fish for trophy tarpon, bonefish, redfish, snook, permit or edibles that you can take to a local restaurant for your own "fresh catch" dinner! Whether you are an experienced fisherman or this is your first time on the water, Capt. Horsley will guide you through a fishing adventure that you won`t soon forget. Full service marina with offshore and backcountry charters, Party fishing boat, Boat rentals, Fisherman`s calendar, Accommodations, Transient Dockage, Covered storage, Fishing vacation packages, Islamorada fishing tournament information. Backcountry fishing guide with 30+ years of experience. Docked at Bud N Mary`s. Captain Perry Scuderi has fished the backcountry and flats of the Florida Keys since 1977. For the last 12 years he`s been a professional guide. It is his job to catch you the fish of your lifetime. Capt. Perry started coming to the Keys with his family and friends when he was six years old, back in 1977. He was hooked. Every opportunity, weekends, holidays, summers, He came to the Keys. If you`ve been here, you understand. If you haven`t, well, you`d do yourself right to spend a few days in what a lot of people call paradise, & and if the fish cooperate, your friends will beg you to stop talking about your trip. Capt. Perry has a lot of young kids that fish with him, so he has a 10,000-question per trip limit & would you believe some kids reach it before they even leave the dock? Frequent and pressing questions include "How deep is the water?" "Will we see a big shark?" "Have you ever fallen in?" Call Capt. Perry to book your fishing trip of a lifetime today! Premier saltwater, fly fishing resource also offering unique retail lines for outdoor men and women. Guided charters - fly fishing school. Hello from Capt Kevin Brown owner and captain of Gold Reserve Charters. My air conditioned custom 41 foot charter boat is one of the nicest cleanest boats in town. I have been running charters here for over 25 years. I would love the opportunity to take you and your family out and show you the fishing trip of a lifetime ! Offshore or backcountry fishing trips also affordable evening family shark and tarpon trips $450.00 up to 6 persons. Call me and we can tailor the perfect trip for you and your needs !!! Promote fishing tournaments for anglers of all ages in a team event. Promote responsible stewardship of the Florida Keys` many species of fish. They also raise money for Florida Keys charities in a fun family atmosphere. Captain Russ has been guiding folks to fun productive fishing in the Islamorada area for over three decades. BACKCOUNTRY FISHING in Everglades National Park or the Gulf with Captain Russ is comfortable shallow water fishing for Snook, Redfish, Drum, Sea Trout, Spanish Mackerel, Jacks, Sharks and more. Anchor on shallow GULF WRECKS for Cobia, Permit, Tripletail, Pompano, Goliath Grouper and more. March through July hook up your TARPON with TARPON COUNTRY Charters. Carrying a variety of tackle to suit your personal needs. Novice and family anglers welcome, experienced anglers appreciated. Captain Russ loves kids! Light tackle fishing at a light tackle price. Book your fishing trip with Captain Russ and enjoy his casual intensity. Complimentary Key Lime Pie with charter! Follow Captain Russ on twitter for current events and fishing reports. Fishing charters with 24 ft Sea Hunt Bay Boat and a 17 ft Maverick Flats Boat. True Blue Charters does backcountry, fly fishing, wreck trips and much more. Captain Skip Bradeen has been fishing the waters of the Florida Keys since 1966 and has one of the finest top notch charter operations on the East Coast of America. Captain Bradeen has the knowledge and experience to help you land your dream catch. For the ultimate in sportfishing and comfort, book a trip aboard the Blue Chip Too. Welcome aboard the "Gimme Jimmy", a 39` Custom tournament proven, beautiful fishing boat with restroom, top notch equipment, and an expert crew - located at Bud N Mary`s Fishing Marina. 1/2 day, Full day or Bahamas Offshore Angling at its best! The Islamorada Charter Boat Association is committed to banding together and protecting the fish and fishermen that they love so much in the sportfishing capital of the world, Islamorada, Florida. Please join them and help fight for Islamorada`s special fishery. Charter Fishing - Islamorada Offshore Charters welcomes families and anglers regardless of their fishing expertise. They know that there is nothing like spending a day on the water with your loved ones. Docked at the Legendary Bud N Mary`s Marina in Beautiful Islamorada! 70-foot party fishing boat - makes three scheduled 4-hour long trips per day. Docked at Postcard Inn Marina at Holiday Isle. The Reel Sharp is a 33 ft Hydrasport with triple 250`s and a custom tower docked at Worldwide Sportsman. They have 20 years experience fishing the keys, and one of the keys top captains, Galon Johnson. Reel Sharp offers many different world class fishing trips ranging from reef, offshore, Bahamas, swordfish,and night fishing. The Reel Sharp reaches cruising speeds of 45 mph, so no matter what custom trip you choose you will get there fast with a guaranteed good time. Full service marina with boat, kayak rentals and charters as well as the Famous FEED THE TARPON area for the family. Captain Michael (Party Boat), The DirtyBoat, Captain Joe Saba (Offshore), Captains Mike Patterson and Ron Howell(Backcountry)and Robbie`s is famous for its Reef Snorkel Trips aboard the "Happy Cat" a beautiful new 43` Catamaran ! They have two trips Daily and one Sunset Trip on the Happy Cat. World Class Islamorada Fishing with Captain Butch Green! The Sassy Lady is available for full, half 1/2 day or three quarter 3/4 day, private or split sport fishing charters. Night Tarpon and Shark trips are also available. Full Day 900.00, 3/4 Day 800.00, 1/2 Day 700.00 or Night Trip 350.00 - Sassy Lady Charters takes you on a large 34` Hatteras capable of handling the burly open waters surrounding the Keys. Strictly Business is a fully equipped 38` Foot Bertram. The Crew specializes in reef & offshore fishing in Islamorada and the Florida Keys. Call Capt Wesley King today to book your extraordinary fishing trip! Experience the best the Florida Keys have to offer aboard our newly rebuilt, luxury 53` Hatteras with twin diesel engines. We bring a new level of comfort and service to sportfishing while our air conditioned cabin keeps you cool on the hottest days. Team Warrior prides ourselves in having the perfect boat to get you to the fish fast, safe and comfortably; then we help you reel in your catch! Our mission is to make sure you have the greatest trip possible and we do this in first class style with friendly camaraderie. When the weather might keep others at the dock the Hatteras will still be fishing, this is what it was designed for and this is where it shines. A quaint Florida Keys tackle shop continuously in business for over fifty years. They carry all essential supplies for your tackle box and more. Abel`s is staffed by knowledgable crew members who will be delighted to enhance your fishing adventure as you float your boat. Their motto is "Fish like a local...Catch like a pro." Open daily at 5:30 am until sunset 7 days a week. Services include fresh and frozen bait, rods, reels, hooklines, sinkers etc. They also have lobster gear, refreshments including water, beer, snacks and icecream. Lodging on water with new pool and marina. Convenience store and deli on property with boating and fishing supplies. Bayview Inn and Marina has jetskis/watersports on property and they sell fuel for boats. RV Park with oceanfront sites available. Marina on site. Timeshare and resort located on the Atlantic Ocean. Full service marina, restaurant, lounge, pool, tennis, boat rentals. Waterfront Caribbean Market with Coffee Bar, jet ski rentals, unique gifts and everything from patio furniture to Mexican pottery, and a natural sponge market (featuring Spongeman) live lobster, clothing and handmade lobster trap frames made from reclaimed lobster trap wood, custom framing, canvas prints, photography and ceramic tiles; Old Conch Harbor is also home to a 22 Slip Marina and the famous Old Tavernier Restaurant. Dining, Dockage, & Lodging on Snake Creek. Casual relaxed oceanfront cafe overlooking the marina. Fresh local seafood. Come by boat - we`ll cook your catch! Happy hour 3-6 with dollar off premium drinks. Live waterfront entertainment - call for schedule. Retail sales of fishing rods and tackle. Sail away on their 23 to 41 foot sailboats. You can go bare boat or with a skipper. Transient and long term marina slips are available. Full service marina with offshore charters. Wahoo`s Bar & Grill - Casual oceanside dining indoors or outside at the bridge bar overlooking the marina where you can watch the fishing fleet returning from a day at sea. Theyll cook your catch! Bar, wine list, happy hour & live music. A Mega-sized store featuring a complete line of fishing equipment and outdoor apparel. Also a full service marina (World Wide Sportsman Bayside Marina) Home to an authentic looking replica of Earnest Hemingway`s beloved boat, the Pilar and a beautiful salt water aquarium full of indigenious fish.